Yelling “Fire (Marshal)!” in a crowded theatre scene shop can often have the same results as the original phrase. 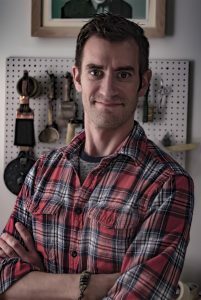 Guest Author Jason Strom suggests a few straightforward measures to practice shop fire safety, demystifies the role of your Fire Marshal, and offers that OSHA might be more than just a four-letter word. Fire Marshal. There, I said it. If you have not closed your browser and run out of the room, kudos to you! Whenever the idea of a visit from the fire marshal comes up it can bring on a cold sweat and frantic cleaning. This is a common response to an inevitable, and albeit necessary scenario. But it doesn’t have to be that way. Information is passed around in faster ways than ever before, technology is improving at a rapid pace, and we as a species are experiencing the world in a broader sense than most of us could have imagined. Perhaps it is time that we begin to look at safety in a new light. Perhaps it is time we approach the fears we all have from the people and standards that are put in place to help us do our job. Before we can start talking about the people behind such emotional responses we have to talk about the emotional response derived from the people. Fear is a driving force in today’s workplace. It’s everywhere and we don’t realize it, and worse, we don’t talk about it. Fear of failure, fear of rejection, fear of change. Unfortunately, success is often measured in fear-based metrics. Managers use fear all the time on their employees. Don’t get me wrong, fear gets results. 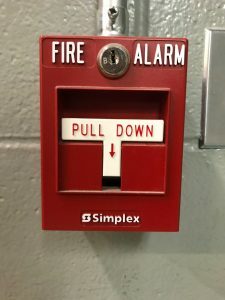 When you hear that the fire marshal is on the way, you clean like mad, hide all the chemicals that should be in the flammables cabinet, take down the extension cord that was artfully draped over your hotplate, all because of the fear of being chastised by the one person who is there to keep you safe. But, why do we choose to live that way? Why are we so reactionary to the inevitable appearance of a person meant to keep us safe? Instead of “Fire Marshal”, we may have generated in our minds the negative connotation of the Safety Police. With that notion planted firmly in our heads, it is easy to become complacent and reactionary, two things that can lead to accidents. Those two things go hand-in-hand. Once you change one, the other will follow suit. If you become proactive about safety, you will begin to care more about everyone’s well being. The same works in reverse. Pretty straight forward, and altogether positive. When OSHA shows up to inspect a space, it is more often because an accident has happened that requires them to investigate. They have a high standard and rightfully so. Workers should not feel unsafe doing their job, and worse, unknowingly perform tasks that could put them into an unsafe or potentially fatal position. So, how do we get ahead of the curve? How do we stop the reactionary habits, and instead embracing safety and begin practicing proactive safety measures with an eye towards preventative measures? Reaching out to your Marshal is a key step in helping garner a working relationship with them and show them that you are committed to creating a safe working environment. Every Fire Marshal is different and will be governed by local and state laws. They can can help you understand those laws and make sure that you are working within the standards set in place. Allow your Marshal to get familiar with your practices in the shop and the theatre. They can help advise on exits, egresses, and fire extinguishers before there is a problem. At FSU, we are on a first name basis with our Marshal, and we love it. Whenever a design calls for a unique material or process, the first thing I do is contact my fire marshal and explain what we are trying to do. If he has concerns, then I make an appointment for him to come down and conduct a test of the material. We take the material, fire extinguisher, and appropriate PPE outside and hold a flame to the material and see what happens. Please Note: I am not a Fire Marshal. I allow him to conduct his own test and either sign off on the material, or reject it. Most of the time I know what he is going to say, but I have also been pleasantly surprised by some of his responses. He is willing and able to work with us to find a solution, because I have garnered a relationship with him. By doing that I have established a trust between us. I completely respect that trust and want to nurture that relationship. We have brought in the fire marshal to review ground plans for egress, possible audience interaction, and fire safety plans in the theaters. We respect and value his input. This approach has given our students access to not only a professional Fire Marshal, but has altered their perception of safety from a negative to a positive. We have created safety advocates that are no longer waging a war against safety, but rather embracing it and will be able to do their craft in a safer way for a longer period of time. 2. 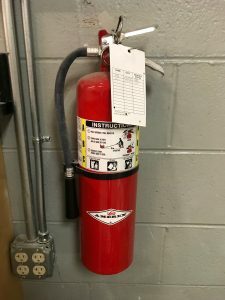 Check your fire extinguishers on a monthly basis. They should have a card attached to record the monthly checkups. The check usually consists of inspecting the hose to make sure it is not cracked or worn, and checking the pressure level on the gauge. 3. Give your employees authority. Your employees can be your biggest ally in creating a safe working environment. Bring them into the mix by giving them the authority to be there own safety advocates. That starts with information and providing your crew with the proper regulations that are established. Give them the responsibility of being safety advocates. 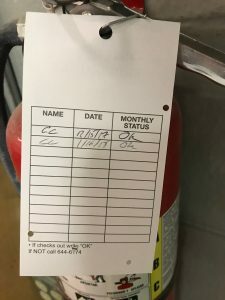 This could be checking fire extinguishers on a regular basis, organizing the flammables cabinet, or establishing a Safety Data Sheet log. Reward them for being safe. If you set the precedent that safety is important, your crew will follow you. Back at FSU, we frequently allow our Graduate Students to establish safety protocols that are reviewed by faculty, staff, and fire marshals. 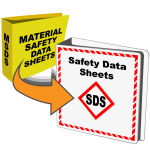 These might include fire drills, safety checklists for spaces, or safety posters for machinery. This gives them familiarity and authority to be their own safety advocates. We as a faculty and staff are rewarded by seeing new students follow in the footsteps of their peers and begin to acquire the proactive mentality early in their education. These New fashion statements brought to you by the students at FSU. This was only part of the PPE setup. Organic vapor masks and nitrile gloves were donned after the photo. Take note of the signage behind our central figure. Signage should be simple and clear. Yup. That sounds like shooting yourself in the foot. But similar to the Fire Marshal, they are there to reduce the risk of injury and help you do your job. Take a minute and go back to the OSHA Mission Statement. The last six words are worthy of reading again: “provide training, outreach, education, and assistance.” They are so much more than “Safety Police”, but rather Safety Advocates. Utilize their services and learn from them. 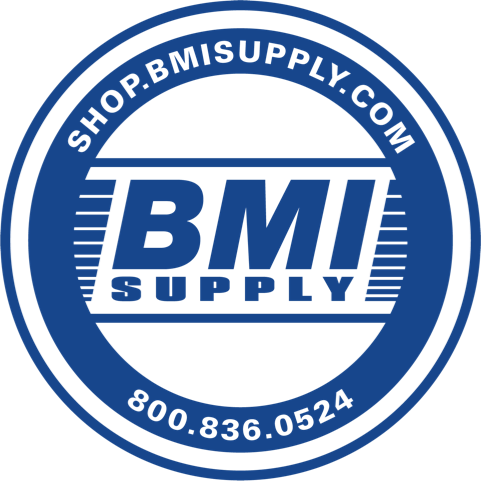 They will be able to tell you certain regulations that apply to your shop and provide you with relevant information. They might even point out problems that already exist in your shop. But establishing a good relationship with them from the onset can save you time, money, and possibly injury in the future. This idea of safety advocacy has changed the way many companies approach safety. J.R. Clancy posts scary rigging photos on facebook all the time, and yes, they are frightening. They do this not to shame you, but to make you aware and, as the saying goes, if you see something, say something. Not a bad mantra to live by. This has changed the way I perceive my job. Before this, the desire to skirt around safety issues was strong. Not because the issue didn’t exist, but because I thought it couldn’t happen to me. I would say things like, “I can just do this one thing quickly and I don’t need to wear gloves” or “Oh, just roll the genie over there real quick and let me reach over the edge of the bucket without the outriggers in to adjust this light.” A whole host of “What-ifs” have floated into my head as I write those two sentences. 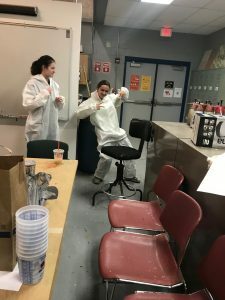 What if I reach into the wrong bucket of material and get a chemical burn? What if I lift a piece of scenery and cut myself on a protruding staple? Minor but preventable. What if I reach too far in that genie? Yup, the good ole days. Were the ole days really that good? The more I look back, the more I regret some of my decisions and am thankful that more horrible things didn’t happen. What about the art? Does safety get in the way of art? How does this affect my art? Honestly, it’s made me better. Instead of working so fast that I ignore safety protocols, I plan more. I think about what I am doing and make sure that my crew and I are safe. I do more testing and research to know what I am working with and that I am using the appropriate PPE. I communicate more with safety personnel and have gained a wealth of knowledge about materials and safety procedures. It has given me boundaries and made me less afraid to do things. If I know a particular material requires a certain level of safety, I can confidently approach the material and know what my boundaries are. Where do we go from here? Well, it starts with us. It starts with changing the habits we are so accustomed to. Stop flying by the seat of our pants and begin planning ahead. Know more. Do more research into what you are using. It’s on us to change not only our own misconceptions, but the future generation’s. When I was working as a TD, if I had questions about something crossing the proscenium (fire curtain) line, fire retardant testing, or any other safety issue, I would take plans to our city fire marshal very early in the planning stages and get his advice. It was very pleasant not living in fear of a visit, and when he showed up, we were already acquainted. I think many people would be surprised that most Fire Marshals main goal is to make sure people are safe and have a safe work environment. I have enjoyed working with FSU Fire Arts over the years.